In a medium bowl, marinate the salmon cubes in the teriyaki marinade for 20 minutes. Meanwhile, soak 12 wooden skewers in water for 15 minutes. Remove salmon from marinade, thread the salmon cubes on the skewers. Prepare the dipping sauce: In a small skillet over medium-high heat, heat the olive oil. Add the onion, garlic, crushed red pepper and ginger. Sauté the onions for 3 minutes, or until soft. Whisk in the soy sauce or vinegar, peanut butter, water and brown sugar. Continue cooking until heated through. Remove from heat, add the green onions. Heat a grill pan over medium heat, coat with cooking spray. Grill salmon skewers 3 to 5 minutes on each side until seared and cooked through. Cook the ramen noodles according to the package directions. Drain liquid. 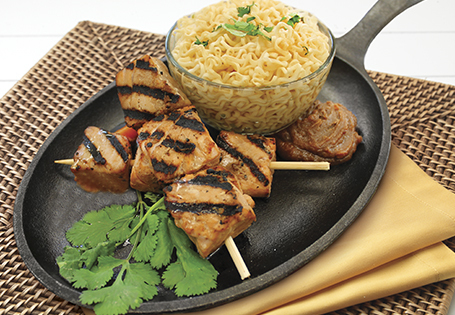 Serve the salmon skewers with a bowl of peanut dipping sauce and a bowl of ramen. Garnish the salmon with chopped cilantro and any drippings remaining from the grill pan.